It’s actually a house built around an older cabin! Can you see the older cabin through the windows? Mountain cabin enthusiasts, this might be a new cabin idea for you. 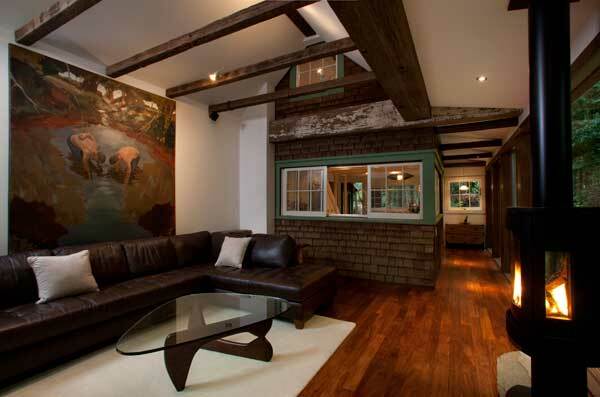 This cabin was actually built around a pre-existing shingle-style cabin. 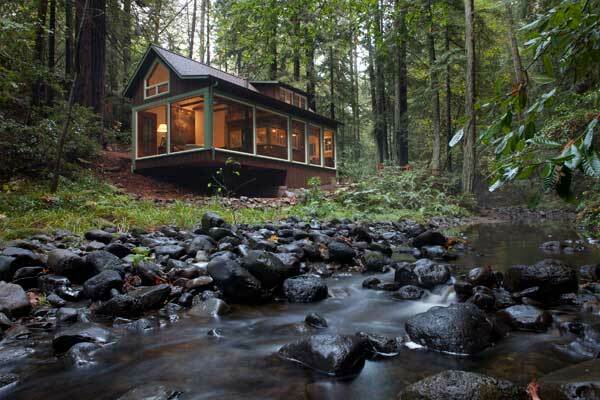 The architect behind the cabin modification overcame a couple of issues they had been dealing with: one was that the creek that runs outside the mountain cabin in the forest couldn’t really be seen from the cabin. The architect, Amy A Alper, designed a double-height living room addition and added this to the original structure by wrapping it around it. If you look in the window in the photo above, you can probably see the shingle siding of the original structure inside this cabin. An idea you don’t come across every day, I think you might agree? It even kept the period windows from the old structure. To build a cabin addition ecologically, they used reclaimed beams to tie the old and new cabin parts together. They tried to harmonize the look of the cabin addition to the woods that surround it. This building idea was the work of architect Amy A Alper of Alper Archiect (visit her click here).